My life companion Lynn Axelrod and I have just returned from Durango, Colorado, where we attended an annual conference of the International Society of Weekly Newspaper Editors at Fort Lewis College. Two posts will deal with our adventures. The second will concern transportation, ranging from driving “the highway to hell” (in the words of the Durango Herald) to travel by old-fashioned steam engine and modern Amtrak. Because this first post deals with my receiving a journalism award, I’ve let Lynn prepare it. The highest international award in the English-speaking world for editing a weekly newspaper went to Dave Mitchell of Point Reyes Station last week. 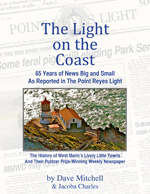 Mitchell, 70, who retired in November 2005, edited and published The Point Reyes Light for 27 years. On June 28, Mitchell received the award in Durango, Colorado, during the annual conference of the International Society of Weekly Newspaper Editors (ISWNE). Editors from throughout the United States and Canada, as well as from England, Scotland, and Australia, were on hand. After he died in 1970, “the New York Times described Cervi as ‘one of the most outspoken voices in American journalism,’” ISWNE executive director Chad Stebbins has written. “The award is presented not for a single brave accomplishment, however deserving, but for a career of outstanding public service through community journalism and for adhering to the highest standards of the craft with the deep reverence for the English language that was the hallmark of Gene Cervi’s writing. Although the four-day conference was held in Colorado this year, ISWNE’s annual conferences are often held abroad: Calgary, Alberta, 1994; London, Edinburgh, Cardiff & Dublin, 1995; Halifax, Nova Scotia, 1999; Victoria, British Columbia, 2000; Galway, Ireland, 2003; Edmonton & Fort McMurray, Alberta, 2005; Charlottetown, Prince Edward Island, 2009; Coventry, England, 2011. In 2016, the group will head to Australia. In 1979 when Mitchell and his former wife Cathy published The Light, the newspaper received the Pulitzer Prize for Meritorious Public Service. It was only the fourth year since the prizes were established in 1917 that any Pulitzer had gone to a weekly newspaper. The prize was for an investigation and editorial crusade warning about violence and other illegal activities by the Synanon cult. Synanon, which officially dissolved in 1991, was headquartered on Tomales Bay in Marshall during much of the 1970s. Mitchell’s new book, The Light on the Coast, which was coauthored by Jacoba Charles, includes key articles and opinion pieces about Synanon. Using news stories published when events occurred, The Light on the Coast tells the history of West Marin since the paper’s founding in 1948. At ISWNE’s request, Mitchell gave an hour-long talk on Synanon and other stories from the book. The Light’s reports on five waves of ethnic immigration to West Marin beginning in the 1850s were a major part of his talk. Fort Lewis College, which is named after Lt. Col William Lewis, a hero of the Union Army in the Civil War, is in the San Juan Mountains of southwestern Colorado at 6,872 feet in elevation. It borders wildlands, and a small herd of mule deer graze the campus undisturbed. Nominating Mitchell for the award were San Francisco Chronicle reporter and columnist Carl Nolte, retired Santa Fe Reporter editor and publisher Richard McCord, and California Newspaper Publishers Association executive director Thomas Newton. Richard McCord (seen introducing Mitchell at ISWNE’s awards banquet) is best known nationally for his 1996 book The Chain Gang, which exposed the Gannett newspaper chain’s illegal efforts to drive competitors out of business. Congratulation to a wonderful writer, superlative teacher, and distinguished scholar who has been deservedly noted for his excellence in journalism. As a former student, I must add that Dave Mitchell is a great instructor of journalism as he was (and is) a distinguished journalist. I shall pass this news on to Upper Iowa University. And to you, Lynn: this is a wonderfully comprehensive report ~ how proud you must be! I will be sharing this with many retired members of the Sheriff’s Department as well as with about 60 Marin expatriates relocated to our Gold Country foothills. As an aside for your other admirers, my former wife, our two young children and I were caretakers of the defunct Synanon facility in Marshall for five years. The memories, the investigations and the weird relics are haunting to this day. Pat and Leck passed this on to my Dad (Robert) who passed it on to me. You deserve the acclaim and I am about to go order your new book. Congratulations to you, Dave, and thank you for the great reporting, Lynn! Sounds like you had a fun trip all around. I visited Durango back in the eighties and remember it as a fun little town. Congratulations! I recently read an old grant proposal seeking funding for internships for the local papers. Among other things, it spoke of the courage it takes to write for a local paper. It pointed out that in a urban area the reporter is anonymous, but in a “village” you have to walk down the street the next day and face people who are unhappy with your reporting. You certainly never backed down from reporting as honestly and accurately as possible, and you have always done it with humor and grace. This community is very fortunate that you have been a part of it for so long. Congratulations Dave! I am so happy to see you honored as you so well deserve. What a testament to your life’s work! We who know you so well as such a dedicated member and friend of our community here in West Marin, salute you. Just reading this for the first time, Dave. Herb Caen would be strutting the halls with immense pride. Sparsely Sage and Timely is powered by	WordPress 4.9.10 and delivered to you in 0.549 seconds using 56 queries.